You’ve gotten the perfect haircut—now, we’re here to take things up a notch. Color is everywhere these days, and no matter if you’re new to the scene or a frequent foiler, there’s a lot to consider. We sat down with Chrissie Gilberti, our Director of Hair Color Education, and took some notes on how to get the best hair color of your life—read on for all the insider tips! You’ve pinned your muses, scrolled through countless Instagrams and penciled in your appointment. The imagination doesn’t stop there—before you can take your new hair selfie, we want to hear your thoughts on color face-to-face. All of our hair services come with a complimentary consultation, whether you’ve been coloring your hair for years or are a novice to anything but your natural locks. This consultation is crucial to making sure your colorist knows exactly the look you’re going for, every single time you sit in our chairs. Think of our consultation like a first date, or a visit to the hair doctor—we’ll chat about your history with color, ask to see some of your must-copy muses and even talk about your hair cuts, too. This is your time to speak up about your concerns, and let us know what you want, and don’t want, to see in your new color. We can’t say this enough: don’t be afraid to ask questions—we promise, we’ll be asking them, too! It’s our way of getting to know you, and seeing what you see. (And no question is too small—that’s our philosophy.) The best part about our consultation is learning all of your options—the more we learn about you, the more tailor-made your options can get. A big factor when coloring your hair is considering your commitment level. Talking through your daily routines and learning more about your lifestyle can help us recommend the best, most manageable look for you—investment and maintenance-wise. For example, if rocking a stellar ultra violet purple has been on your to-do list, but you consider yourself to have a fuss-free, low-maintenance beauty routine, our colorists would work with you to achieve a color that suits both your style and your day-to-day grind. Our favorite thing about Aveda Color? It’s gentle on the hair with little-to-no damage—and so highly conditioning, in fact, getting a color service can actually be considered a treatment for your hair. For those looking to cover greys, add-on a playful hue, or go darker with minimal maintenance, Aveda’s new Demi+ line is your go-to. (We’re certifiably obsessed.) An effortless approach to a killer new look, it makes for a great introduction to the world of hair color – all while adding an instant, healthy shine. The new demi-permanent line is fully customizable, yet easy to apply. Its gel-based formula makes it glide right onto your hair with total saturation (not to mention amazing results). And with a processing time of only 5-20 minutes, you can kiss those long wait times in the chair goodbye. It’s so quick, you can even add on this service at the last minute, just say the word! Your color’s intensity and coverage is completely customizable, too – so if you’re thinking about changing up your color, you can at whatever shade and placement you please. From all-over saturation to a single pop of peekaboo pink, anything’s possible. Birthday hair is the best hair! Thanks for sharing @mollygrahammm  | haircut by @tatumneill! #loveparisparker tag us to be featured! And of course, blonding, lightening and highlighting services will always be wildly popular. These services utilize Aveda’s other color lines to actually lighten the hair, which require a more permanent formula. But for those who want something less committal, Demi+ is the answer we’ve all been waiting for! Permanent or demi-permanent, there are things you can do to keep your color lasting longer and as vibrant as possible. 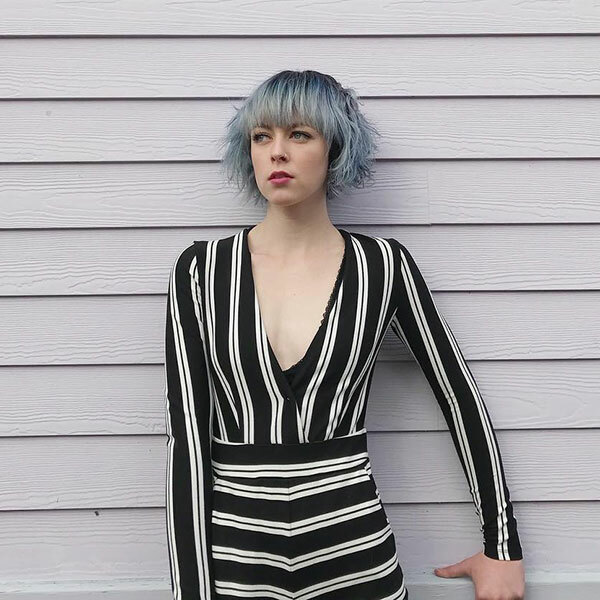 Chrissie recommends using a color-safe shampoo, (like the fade-resistant Aveda Color Conserve line, which protects and extends your hair’s vibrancy) and only shampooing your hair when it’s dirty. If you’re an avid exerciser, here’s a tip: using a light conditioner in the shower is an excellent swap for shampooing every day—you’ll feel refreshed and conserve color all at the same time. Or, use a calming and reviving dry shampoo like Aveda Shampure Dry Shampoo to absorb your hair’s excess oil between washes. For inspiration to bring to the chair, start at our Pinterest boards. Then, when you’re ready to make some magic happen, book your appointment online or give us a call at 877-TRU-GIFT.